It's probably pretty hard to top the line-up of veteran action heroes that Liam Hemsworth joined in The Expendables 2, but Gary Oldman and Harrison Ford can probably give them a run for their money as the two join The Hunger Games actor (and brother of Thor himself, Chris Hemsworth) in Robert Luketic's financial thriller Paranoia. Hemsworth plays Adam Cassidy, an entry-level employee at The Wyatt Corporation. When he becomes enlisted as a company spy, pinned against a rival mogul (Ford) he becomes a pawn in a corporate game bigger than he could have ever imagined. 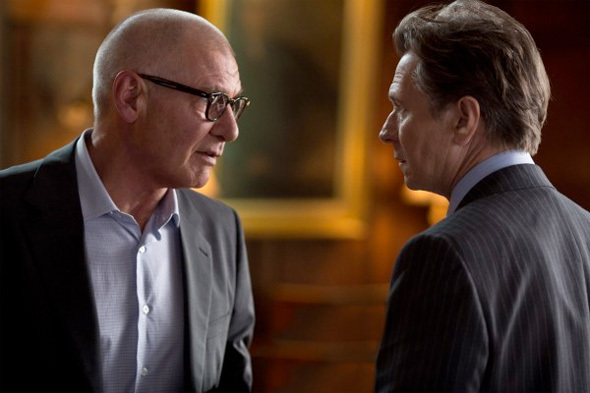 Adam must find a way out from under his boss (Oldman), who will stop at nothing to win a multi-billion dollar advantage. First look photos below! Robert Luketic (21, Killers) directs Paranoia from a script by Jason Dean Hall and Barry Levy, based on Joseph Finder's novel. Adam Cassidy (Liam Hemsworth) is a normal guy trying to get ahead in his entry-level job at Wyatt Corporation. But after one costly mistake, Adam’s ruthless CEO, Nicholas Wyatt (Gary Oldman), forces him to spy on corporate rival, Jock Goddard (Harrison Ford), Wyatt’s old mentor. However, Cassidy is just a pawn in Wyatt’s game and realizes he must find a way out from under his boss who will stop at nothing to win a multi-billion dollar advantage. The film hits theaters October 4th, 2013. Put in Michael Douiglas and we could have had a good Wall Street 2. There's Harrison Ford Finger, a sign that he's phoning it in. Yeah, it's sad to say, but true. Harrison looks like he hasn't cared for anything but the paycheck for years. I live directly where they were shooting scenes for this movie in Philadelphia, in Center City. I live above Monks Cafe. I'm excited.